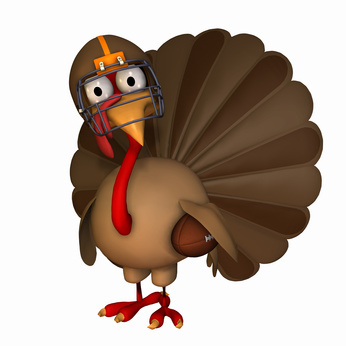 When you think of Thanksgiving, first things that come to mind have to be turkey, mashed potatoes, pie, family, that crazy uncle, fall, being thankful and football (and not necessarily in that order). Football has truly become a great piece of the Thanksgiving tradition in this country and we get to enjoy it this Thursday with three quality games. And thus, it is time for my week 12 picks. You know, the Lions really should have beaten the Packers on Sunday afternoon. Aaron Rodgers was not great and the Packers were missing field goals and struggled to move the ball. But Matt Stafford was a mess, throwing the ball all over the place, except to his wideouts, and his two interceptions cost them what should have been a victory. And now the Texans are coming into town after barely surviving the Jaguars, and I am feeling a blowout. Robert Griffin III was absolutely brilliant last Sunday against Philadelphia. He went 14 of 15 for 200 yards and three touchdowns. Yes, the Eagles have given up and are cruising to get Andy Reid fired, but those numbers are truly awesome. However, I don't think he can lift the Skins to a victory over the Cowboys, especially with how awful their pass defense is. The Cowboys aren't looking great, but Tony Romo has been tremendous and Washington can't slow down anybody in the air. Personally, I do not even think it is a question that the Patriots have the best offense in the league. They are averaging 35 points a game, nobody is within 50 points of them, they have cracked 50 twice, they have the top offense statistically and Tom Brady has been brilliant. And check this out, every time the Jets have won a game this season, they get blasted the next week. Call me crazy, call me maybe but the Patriots are my Lock of the Week. What is going on with the Dolphins of late? They looked to be a real playoff contender in the AFC, and now they have lost three games in a row. Ryan Tannehill has been very inconsistent under center, Reggie Bush has struggled to run the ball and overall, the offense has been stagnant. That does not bode well against a defense as good as the one the Seahawks have, so give me the 'Hawks, even though they are not great when they play on the East Coast. Ultimately, I believe Jay Cutler will go this Sunday but even if they still have to use Jason Campbell at quarterback, I like them to take out their rivals. The Vikings are one-dimensional on offense and the Bears have the capability to slow down Adrian Peterson and make Christian Ponder beat them, which you know the Bears' excellent secondary will be licking their chops to get that opportunity. It is not that often that in a game when your quarterback throws five interceptions and no touchdowns that you got much better quarterback play than your opponent, and yet that is what happened with the Falcons against the Cardinals. Plus, the Buccaneers have a good matchup offensively considering the Falcons are awful against the run. But why am I picking the Falcons? Because Tampa Bay couldn't stop anybody through the air and Atlanta will throw it often. Holy smokes, how about Chad Henne last week against the Texans? He comes in after Blaine Gabbert got hurt again, throws four touchdown passes and at one point led the Texans by two touchdowns in the fourth quarter before losing in OT. The team may as well move forward with him considering where the team is but I ultimately think it was a lightning in the bottle moment and in the meantime, the team still blows. Oakland has been a mess this season, especially on the defensive end. And then when Carson Palmer throws a pick-six, his trademark move, the fun really sets in. Meanwhile, the Bengals did beat the crap out of an awful club but they still looked good regardless and the Andy Dalton-A.J. Green I-275 connection has been great. Give me the home club here. Man, did it get ugly on Sunday afternoon in Foxborough for the Colts as they blew a tight game and ended up getting drubbed by the Patriots by 25 points. Andrew Luck threw the ball a lot and made mistakes, but he's a rookie, right? I think that the team is better than that and I believe they are looking for a big bounce-back win. Meanwhile, the Bills are coming off a less-than-impressive win against the Dolphins and have been torched many a time in the air. You know, this game is going to a lot of the country and it is a shame because the Chiefs are a joke and the Broncos are looking pretty good right now. Kansas City can't move the ball, their passing game is atrocious, and the defense is not that great either. Denver is such a superior team than the Chiefs, so the fact that a lot of the country is getting this game is depressing. You think they miss Ben Roethlisberger in Pittsburgh? Yeah, after the tight loss where Roethlisberger probably would have been the difference, I think they do. Not only that, but now Byron Leftwich is hurt as well and the great Charlie Batch will be under center this Sunday. And with how the Browns have been playing decent football of late, give me the upset here. You know what, I think Philip Rivers is better than what he has shown. Yes, he throws a lot of picks but let's be fair to him, he's not exactly playing with the 2007 club and he's obviously been put in a position where he has to be the hero. That said, the team is still being coached by Norv Turner and they still look like crap. The Ravens, on the other hand, are looking like a pretty good club so give me them on the road. Let me tell you something, I don't get how the Rams not only lost to the Jets, but they got creamed by them. I understand the Rams are not great, but the Jets are a joke. But they do catch a break this week because the Cardinals have themselves a fiasco at the quarterback position as John Skelton got benched on Sunday against the Falcons, a game that Matt Ryan all but gave them to win with his five picks, and Ryan Lindley was pretty awful in relief en route to another Arizona loss. The Rams may end up burning me again, but then again, Sheriff Joe may be under center for the Cards at some point. The Saints have been playing great of late, and have won five of their last six. But if you look at who they have played of late and the common trend is that they have played teams that struggle against the pass and considering who they have under center, that bodes damn well for them. But now in facing an elite defense like the one the 49ers have, plus considering that the Saints cannot stop anybody on defense, San Francisco will control the ball on the ground and keep the ball out of Brees' hands. There has been a Florance at every matchup between these two clubs since the turn of the century and the Packers have won four out five, the only loss being in 2004 at Lambeau. Every other time the game has been played in the Meadowlands and each time, the Packers have come out on top. So Green Bay has the Giants' number on the road and we all know how the G-Men are not a great home team. I think we will see a lot of offense but I also think that the Packers' ball-hawking secondary will force Eli Manning into making a critical mistake that will turn the tide. Ah yes, who to take in this one? The Panthers, who have been a huge disappointment and are great at blowing games late, which they have now done a few time. And the Eagles, who have completely fallen apart as I noted earlier. So yes, who to pick? Give me the Panthers. Philadelphia is getting crushed in the air and I think that Cam Newton can make some plays and give them a win. Dude...the Seahawks have changed their logo twice since they used that ugly thing. It's over a decade old. Update much? Dude, as you can tell sometimes I like to mix it up with older logos.